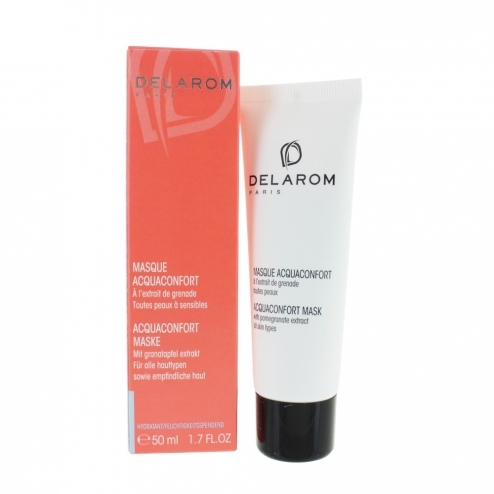 Acquaconfort mask, moisturizing, refreshing and has a smooth creamy texture. It effectively limit water loss by strengthening the moisture barrier. The skin regains its suppleness and vitality. The complexion is bright and unified. Apply all over the face, thin or thick for very thirsty skin. Leave for 5-10 minutes. Massage and wipe the excess or remove with a cotton pad soaked tonic. Use 2 to 3 times a week or daily to very dry skin. The active ingredients: sterols pomegranate moisturizer, sodium hyaluronate powerful hydrating, moisturizing extract salvia immediate and long-term plum butter softening and nourishing, vitamin-rich butter shea moisturizing vegetable glycerin, olive squalane feeding.